Edge Animate offers many ways to configure the Timeline and Stage; you can adjust them to your own liking. This includes an easy way to center the Stage, magnify the Stage, filter elements, and turn Timeline snapping on or off. Centering the Stage: If you start moving, adjusting, resizing, and so forth, you may need to re-center the Stage for better viewing. Magnifying the Stage: For those times you want to see every last pixel of your elements. The Playhead and Pin timestamp: Edge Animate provides more than one way to move the Playhead and Pin up and down the Timeline. Filtering elements: Sometimes you only want to see certain elements. Timeline snapping: Do you like your elements to snap into a precise place on the Timeline or do you prefer more freedom? Configuring the grid view: You can set the grid view to your preference so that you either see a grid or you don’t. Viewing more or less of the Timeline: Sometimes you may want to see the entire Timeline for your composition; sometimes you may want to zoom in. Adding more time: If you run out of time, you can always add more! You might be wondering how Edge Animate determines the vertical order in which elements appear in the Timeline. It all depends on how the elements are arranged. The element that is most in front (appears on top of all other elements) is the first element listed in the Timeline. The element that is most in back (appears behind all other elements) is the last element listed in the Timeline. There are a couple of controls for the Stage that enable you to center it and magnify it. Centering the Stage: If, for some reason, the Stage has gone off-kilter on you and you want a one-click solution to re-center the Stage on your screen, then simply click the Center the Stage icon. This icon is located in the bottom-left corner of the Stage (as shown in this figure). Center the Stage on your screen with the Centering the Screen icon. Magnifying the Stage: If you want to zoom in on the Stage, you can use the magnification tool (as shown). You can either click the orange number and type in a specific zoom level or place your mouse pointer over the number and then click and drag to adjust. Adobe Edge Animate CC provides several tools to help you configure the Timeline so that it appears just the way you want. Playhead and Pin stamp: Provides a means to show you where the Playhead is in the Timeline and the length of time for the animation sequence. The Playhead is represented by the yellow numbers on the left, and the Pin is represented by the blue numbers on the right (see the figure). You can place your cursor over these numbers and then click and drag to change the location of the Playhead and Pin on the Timeline. Filtering elements: Edge Animate provides a way for you to see only the elements with animation sequences or to see all of the elements at once. This doesn’t affect what you see on the Stage, but it does affect what you see in the Timeline. In this figure, on the left, the filtering is turned off, and you see all of the elements; on the right, filtering is turned on, and you see only the animated elements. The Filter control is identified. 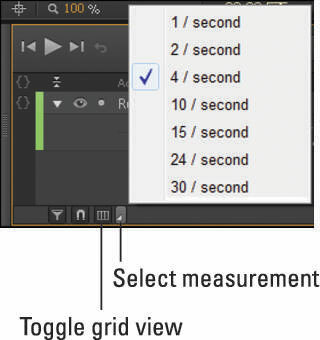 Configuring the grid view: If you want to see precise measurements in the Timeline — anywhere from a full second to a 30th of a second — you can set that view (as shown); you can pull up your choices and toggle the grid view on or off. Timeline snapping: If you choose to turn on the grid view, then you can have the Pin and Playhead snap to the grid by turning on Timeline snapping (as shown). Magnification scrollbar: You can view more or less of the Timeline by scrolling the magnification bar (as shown). You can click to view the entire Timeline, click to either zoom the magnification in or out, or click and drag the icon on the scrollbar. Inserting more time into the Timeline: You can add more time into your Timeline at any point while you’re designing your composition. From the main menu, click Timeline and then choose Insert Time, which is about halfway down the menu. When you do that, a dialog box opens (as shown). Inserting more time into the Timeline. Place the Playhead in the Timeline at the point at which you want to insert more time.